Click Photography Workshops Ltd is committed to ensuring that your privacy is protected. Should we ask you to provide certain information by which you can be identified, then you can be assured that it will only be used in accordance with this privacy statement. Click Photography Workshops Ltd may change this policy from time to time by updating this page. You should check this page from time to time to ensure that you are happy with any changes. Internal record keeping. We may use the information to improve our products and services. We regularly update parents of issues relating directly to Click Photography Workshops Ltd, These communications provide information relating to current projects and upcoming events for individual schools and all schools We may periodically send promotional emails about new clubs or courses, or other information which we think you may find interesting using the email address which you have provided. Click Photography Workshops Ltd uses images by and of its students. We use images on our website both in the school galleries and in tutorials and in social media posts and marketing for our courses. We request specific permission from parents for this use and offer the opportunity to refuse permission for images to be displayed. When we display images we do not identify schoolchildren by full name, using first name and surname initial - ie Adil P or Charlotte W. We may use full names in our Friday Night club - with extra permission sought from parents of older students and we use full names to announce the winners of our occasional competitions. We are committed to ensuring that your information is secure. In order to prevent unauthorised access or disclosure, we have put in place suitable physical, electronic and managerial procedures to safeguard and secure the information we collect..
2. 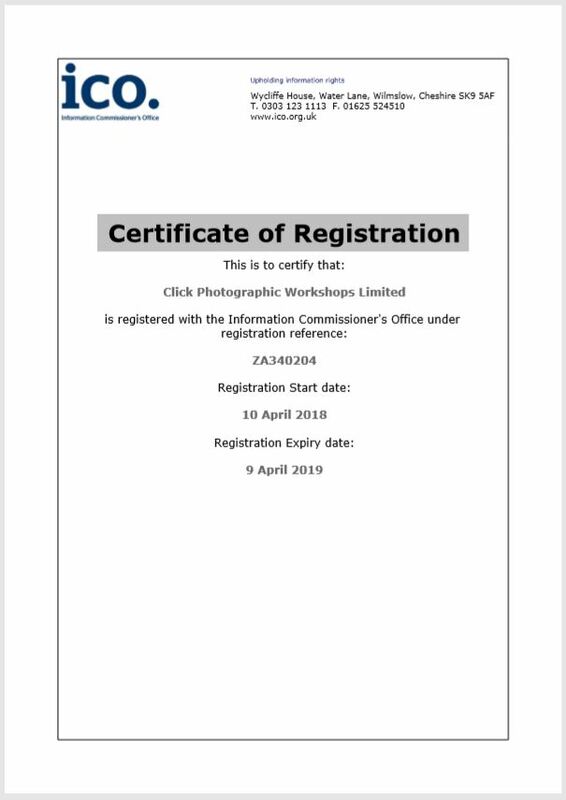 If you have previously agreed to us using your personal information for direct marketing purposes, you may change your mind at any time by writing to or emailing us at Clickschools@gmail.com We will not sell, distribute or lease your personal information to third parties. We may use your personal information to send you promotional information about third parties which we think you may find interesting if you tell us that you wish this to happen.